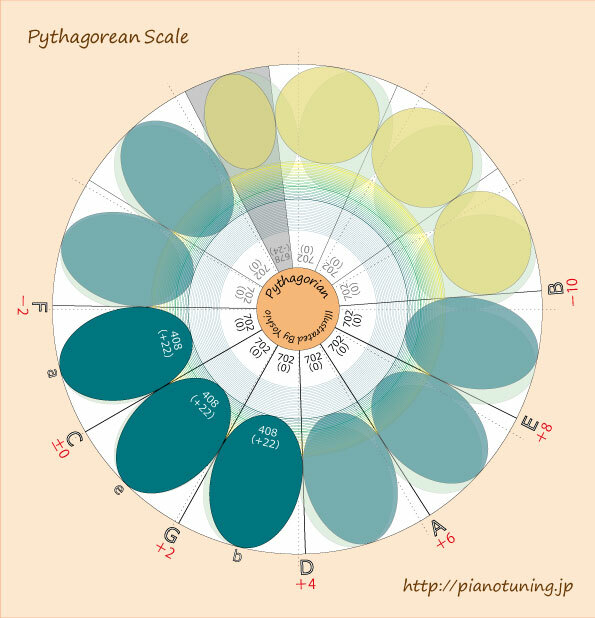 * The scale in this page show a diatonic scale. Major scale constructed of 7 notes. The 3rd overtone is the easiest to recognize. 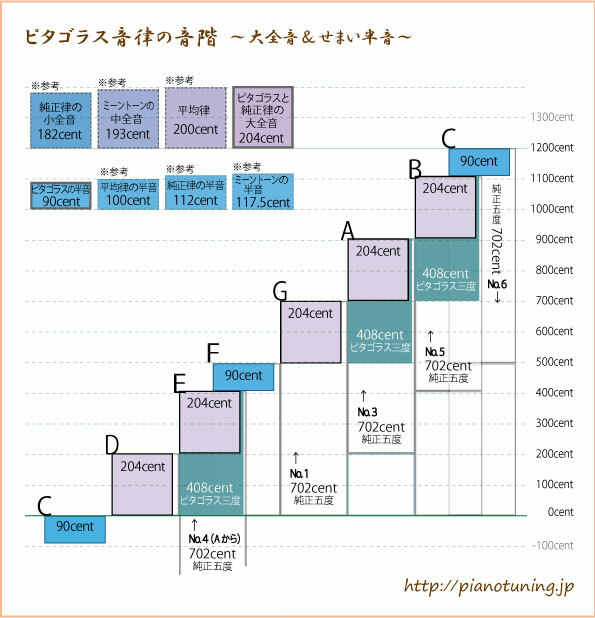 For example G is the 3rd overtone of C.
This interval of 5th is very important for piano tuner. Pythagorean scale is constructed from this pure 5th. But as a result, the intervals of 3rd (F-a, C-e, G-b ) have lots of howling. This was not preferred in the time of Renaissance, and treated as a dissonance. Harmony of Shoh(traditional Japanese wind instrument resembling panpipes ;free-reed instrument used Japanese court music ) gives a feeling of expanse of universe. I made this Pythagorean scale in step graph. Series of five successive upper 5th and one lower 5th start from C.
In this way, 7 notes on the scare are set. This is 4 cents wider than equal temperament.Semitone is 90 cent. This is 10 cents narrow than equal temperament. Major 3rd is 408 cents. This is wide pitch makes a comfortable sound in arpeggio and melodies in fast tempo. It is very interesting that the leading tone becomes higher, when semitone is 90 cents narrow. In classical temperament, scale with 6 successive pure 5th have same step-wise graph. Music pieces of Chopin and Debussy that have lots of sharps# and flats♭, I believe that they composed with the image of the sound with beautiful scale.